Week two is over. I am again writing this on a Sunday morning from my Kampala hotel while listening to the Sunday worship services outside my window as a light rain falls. Although things are quite peaceful at this moment, I think back on how this week has been quite a sobering experience. Since I am here to evaluate the neurosurgical program at Mulago Hospital—the largest and only national referral hospital in the country—I have begun to speak with various staff members associated with the neuro unit. Many of these discussions have happened in the Neuro Ward of Mulago, where "overcrowded" would be an understatement to describe the space. A ward built for about 18 patients frequently carries as many as 60. Due to this overcrowding as the standard practice, it is not the nurses that bear the majority of the patient care burden, but rather the family members that accompany the patients. The family must bring food, water, bedsheets and even drugs for their sick loved ones. There is simply not enough money, manpower or resources for the hospital to treat everyone, so this responsibility must be shared by the patient's family. I can only imagine how people fare when the come to the hospital alone. The already stressed and overburdened staff is spread even more thinly at night and on weekends when only on-call staff is available, and sometimes unreachable during an emergency. Just one consequence of this problem was clear when I sat down to speak with one of the neurosurgery residents. She carried in a few patient records with her, and on top was the file pictured above. This patient file was for a 19 year old man who had an elective neurosurgery the week before. He was doing quite well—talking and reading the day before—and was nearly ready to be discharged. But overnight, there was some miscommunication about his care and an emergency ensued while staff was stretched quite thin. He did not live. The next day, I spoke with a nurse in the Intensive Care Unit (ICU) and she again discussed the overcrowding issue and the lack of manpower to handle all the patients. In the ICU, they have only six or seven beds with the proper equipment to care for a critical patient. Therefore, complex surgical cases like many performed in neurosurgery must be postponed until an ICU bed is available to care for them post-operatively. She pointed towards the bulletin board in the office of the Sister in Charge that had several cases waiting to be completed once a bed was available. There were at least five, all from earlier in April. She asked me, “How many of them do you think are still living?” And I wondered, if they are in fact still living, how many would actually make it long enough to have their surgeries. When I spoke later to a nurse in the Trauma department, she explained that due to a renovation happening at the hospital, her department has only two beds available for critical cases. Many of these trauma cases will be neurosurgical in nature—due to a traumatic brain injury. The trauma department receives the case from the Casualty (Emergency) department and then if they believe it is neurological in nature, they send for the neurosurgeons to assess the patient and take them to the neuro ward to await their surgery (once they are stable). But what happens when it is a night or a weekend and the neurosurgeons are not available? If they cannot assess the patient, then the patient stays in a Trauma bed—one of only two for the entire hospital. So I asked, "What happens if more patients are sent to you but your beds are full?" “They die in casualty,” she said. These are all symptoms of a larger problem, of a hospital that is trying its hardest, but lacks enough resources and manpower to be able to treat all of the patients with need. And although a renovation is in progress that promises more capacity, it is still two years from being complete. 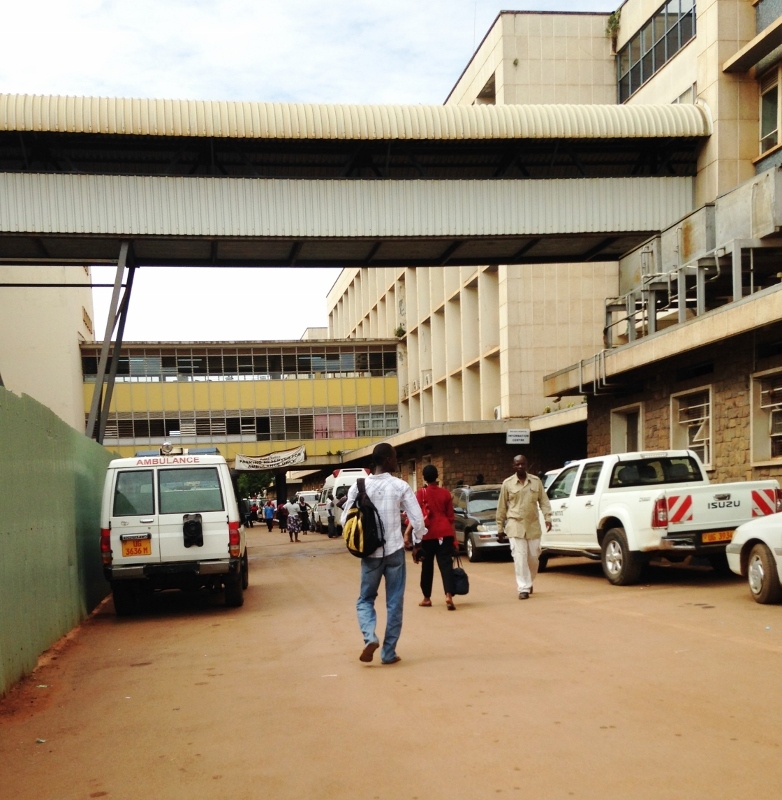 The picture shown above is the emergency entrance to Mulago Hospital. This road is where the ambulances drop off the patients and they are brought to Casualty to be treated. I wonder how much tragedy has been witnessed by these walls and windows … and if they could talk, I’m not sure I could handle hearing what they have to say. The lack of manpower is sad. But the people are strong.